But the tool that came in the kit certainly caused a stir in my office: A Cuisipro Peanut Butter & Jelly Spreader. Apparently, America is suffering from a terrible dilemma, caused when we have to use the same knife in our peanut butter and our jelly. The spread looks a lot like a kayak paddle. In fact, I wondered if some musing river rat came up with the idea while waiting to break into the peanut butter in his back pack. 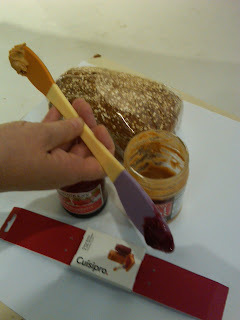 The two ends are helpfully colored brown (for peanut butter) and purple (for jelly). The directions -- yes, it has directions -- explain "Color-coded ends eliminate the risk of mixing food items." Some food journalist I am. I had no idea that getting peanut butter in your jelly qualifies as risky behavior. Sadly, in practice, I have to report the spreader doesn't work all that well. You have to hold it in the middle, which is awkward. And unless you have very small hands, you're going to get either peanut butter or jelly on the heel of your hand. Silly complaint? Sure. 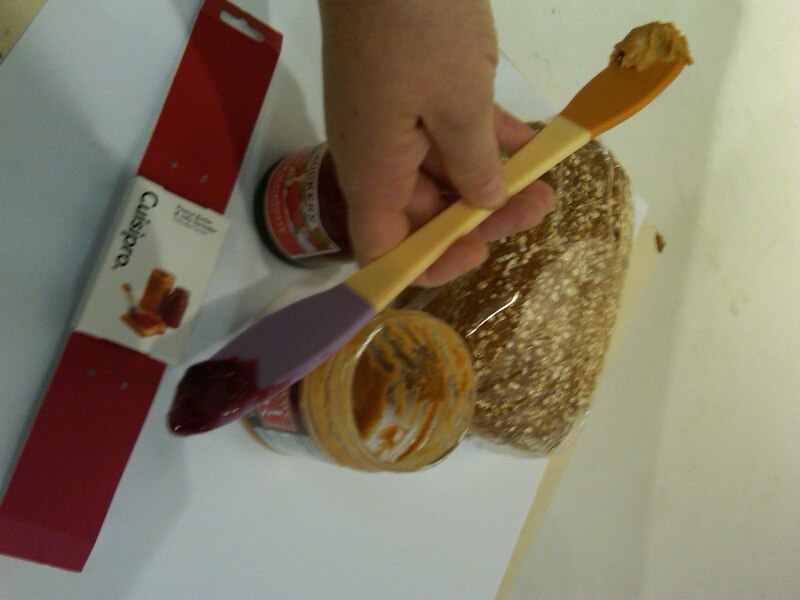 But then again, it's a color-coded peanut butter and jelly spread. It's $10 suggested retail, but you can order it on Amazon for $8.51. It does come with a 25-year warranty, which should keep it circulating through Christmas gag gift piles for years to come. Well of course, you're all winners in my eyes. You're food readers, right? But I'm looking for three specific winners, people who won books in recent giveaways but haven't gotten in touch with me. If I call your name, send your contact information to me at kpurvis@charlotteobserver.com. In our live chat last week, KIRSTY won a copy of "The Pioneer Woman Cooks" by Ree Drummond. Kirsty asked the question about getting a small business reviewed. Also in the live chat, CAITY won a copy of "Planet Barbecue" by Steven Raichlen. Caity asked about summer cocktails. Caity, you definitely need some good barbecue dishes to go with that Southside I recommended. 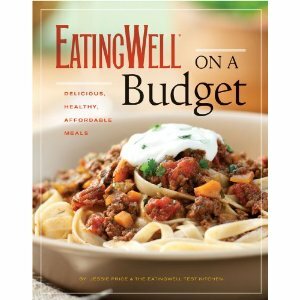 Finally, after Andrea Weigl's story on eating healthfully and cheaply, KELLYC won the copy of "Eating Well on a Budget." Kelly, save me some time and email me. I hate for people to win books and not receive them. Plus, my desk is messy and I need to clean it off. Thanks, KellyC, Caity and Kirsty. People are making all kinds of efforts to eat more local food. In Tuesday's Observer, you can read about a family that ate only whole foods for 100 days. Here's another way to work local foods into your life: The Center for Environmental Farming Systems, based at N.C. State University, has launched a statewide campaign to get you to spend 10 percent of your existing food dollars on food produced in North Carolina. According to CEFS, North Carolinians spend about $35 billion a year on food. If we each spent about $1.05 a day, or $7.35 a week, on locally grown, raised or made food, that would put $3.5 billion into the local economy. If you're a joiner, you can register online to pledge to do it, at www.nc10percent.com. You can also find links to organizations that can help you locate local food sources. CEFS is hoping businesses also will sign up to focus their spending power or host employee challenges to eat local. Compass Group also is a partner. It has pledged to source 10 percent of the produce it sells to N.C. clients from within the state, and will work with CEFS to develop a model "farm-to-institution" buying program. How about it? Do you have clever ideas for how you can boost your local-food spending? Time to toast "Mad Men"
Between the rain and the heat, our mint patch is taller than a hedge and as leggy as it usually is in late August. We've tried to keep up through diligent production of our favorite summer cocktails, mint juleps and mojitos. But it gets boring to always celebrate the end of the week with the same thing. With the return of "Mad Men" on Sunday, I needed a new cocktail. Enter the Southside. The recipe ran in the Observer several weeks ago, in a Chicago Tribune story on the gin trend. 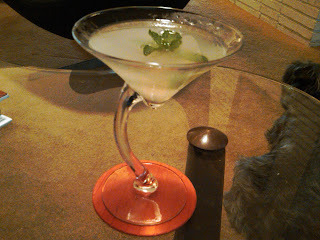 When I saw the ingredients, I had to try it: Mint, lime, simple syrup and gin. One sip and I was sold. Sweet but not cloying, minty enough to be refreshing, with that tart bite of lime juice. Shaken and served very cold, it was a revelation that reminded me of the New Year's Eve long ago when we watched "Some Like It Hot" and got curious about Marilyn's drink, the Manhattan. I fell in love that time, too. In case you missed it, here's the recipe again. Don Draper might stick with Rob Roys, but I think Betty would really like a Southside. Bruise two sprigs of mint gently in a cocktail shaker. Add remaining ingredients. Add ice. Shake. Strain into a chilled cocktail glass. Garnish with remaining mint sprig. Simple syrup: Mix equal parts sugar and water in a saucepan. Bring to a boil, stirring, and cook just a couple of minutes, until sugar is dissolved. Cool and store in the refrigerator. Thanks again to everyone who joined in today's live food chat. Answering questions that fast doesn't live much time for thinking them over, so I hope I gave information that was correct and useful. As promised, we did a random drawing from the names of people who submitted questions. Kirsty won the autographed copy of Ree Drummond's "The Pioneer Woman Cooks" and Caity gets the copy of Steven Raichlen's "Planet Barbecue." If you'll both send your contact information to me at kpurvis@charlotteobserver.com, I'll put the books in the mail. And to the person who wanted to know how to cook a roadkill possum, I do actually have an answer: Possum are scavengers who eat carrion, so the only way to make the meat palatable is to catch them live and pen them up for a week while you feed them clean food. My grandmother taught me lots of useful things like that. Remember last Monday, when really bad storms swept over the area? Really bad, as in "call Auntie Em and grab Toto" bad? Here's where I was: Sitting in my car, waiting it out in a safe spot and happily eating Hmong-style green papaya salad. I was on my way back from Hickory for today's story about Hmong farmers. I had spent several happy hours tromping around rice paddies and having three-way conversations between my translator, Pahoua Xiong, and women who insisted on filling my arms with so much produce, I could barely hold on to my reporter's notebook. While Xiong and I were talking about Hmong food and difficulty finding Hmong recipes, which are mostly handed down by word-of-mouth, she told me there is a restaurant in Hickory where you can get Hmong food. It's called Taste of the Orient on 1st Avenue SW, and the sign claims it serves Thai food. But according to Xiong, if you ask, they can point out the Hmong dishes on the menu. 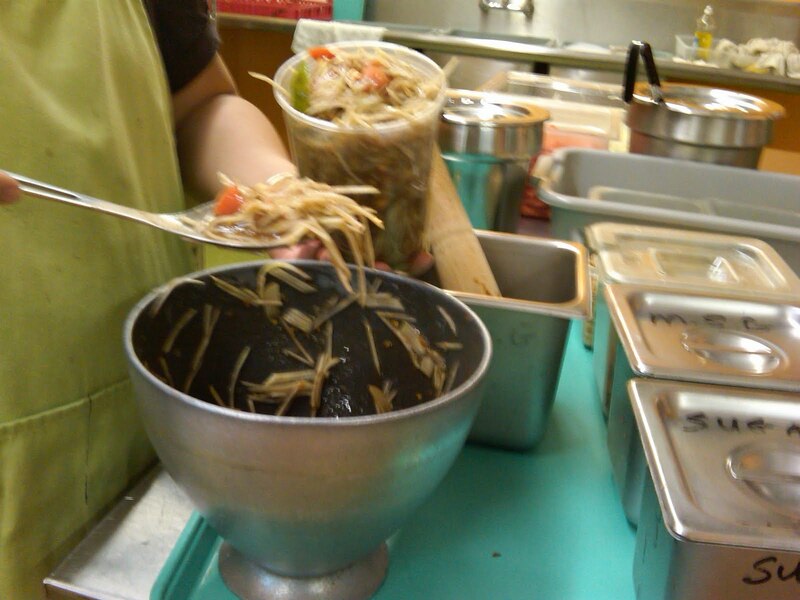 Since Taste of the Orient is closed on Mondays, Xiong took us to a nearby Hmong market, K. Oriental Market on 1st Avenue SW, to get fresh green-papaya salad. Made in a little kitchen on one side of the store, it has shredded green papaya, tamarind paste, lots of lime juice, fish sauce, shrimp paste, sugar, chunks of fresh tomatoes, MSG (Hmong use a lot of MSG but you can ask them to skip it) and plenty of dry-roasted peanuts. The woman behind the counter pounded the tamarind, limes, sugar and red pepper flakes together in a deep metal bowl, stirred in shredded papaya, stirred it all together and packed it into plastic tubs, all for $3 for small (but still pretty big) or $5 for large (very big). On the way home, I pulled over in a safe parking lot to wait out the storm. I pulled open the tub of salad, grabbed a fork and picked my way through a delightful lunch. Outside the car, the storm raged and flashed. Inside, I kept myself calm by focusing on how every bite was different - tart papaya, salty fish sauce, fiery chile heat, crunchy peanuts, bite of lime. I made it home just fine. I adapted this from http://www.allrecipes.com/, changing the ingredients to the ones I saw them use at K. Oriental Market in Hickory. Coarsely mash together the garlic, chile peppers and tamarind paste. Shred the papaya into long strips using a box grater or a hand-held shredder and add it to the tamarind mixture. Mix in the tomato, fish sauce, lime juice, and sugar. Stir well. Stir in the peanuts. Cover, and refrigerate until serving. Can be made a few hours in advance, but it doesn't keep much longer than that. I couldn't stop myself Saturday morning. The tomatoes were in their full glory at the Charlotte Regional Farmers Market and before I knew it, I had a half-dozen kinds. Light-bulb shaped tear-drop tomatoes. Yellow and red Sungolds, a little smaller than cherry tomatoes. A couple of Green Zebras. A few basic slicers. And a bagful of the small White Currant tomatoes grown by Kim at Small City Farms: They're too small to stab with a fork in a salad, so I just carry around a bag of them and pop 'em like M&Ms. 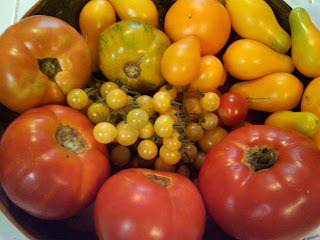 It was tough, but I resisted the paste tomatoes at Dean Mullis' stand, and at least a half-dozen more kinds of heirloom tomatoes from a half-dozen farms. So what to do with all those tomatoes? Tomato sandwiches, for sure. Maybe a few grilled tomatoes. Bruschetta when I get a chance. But first, just because you should revel in tomatoes in July, I threw together an all-tomato salad Sunday, just a bowl of cut-up tomatoes of all shapes and colors, a little fresh mozzarella, and a simple tomato-flavored dressing. How about you? What's your favorite way to make the absolute best use of tomatoes in July? Whisk together the sherry vinegar, tomato paste and garlic in a small bowl. Place the bowl on a folded dish towel and slowly whisk in the olive oil. Flavor to taste with coarse sea salt and freshly ground pepper. Pour over the bowl of cut-up tomatoes, toss and serve. In the ever-expanding world of online journalism, The Observer is delving into live online chats and I've volunteered to be a gastronaut. Mark Washburn has already done it, and I was never the type to let the boys get ahead of me on the playground. The questions will be moderated to keep things clean and on topic (cooking, food, cooking, shopping, cooking, travel, cooking, world history, cooking - you get the drift). Just to keep it lively, let's make it a giveaway. I have TWO books this time. Anyone who posts a question and gives me a name to recognize them by gets entered in a random drawing for a copy of "Planet Barbecue" by Steve Raichlen, or an autographed copy of "The Pioneer Woman Cooks" by Ree Drummond right after the chat is over. Any questions? Good - save them for next Thursday and let me hear from you. Who wins "Eating Well on a Budget"? That would be KellyC, who entered at 12:23 on July 14. KellyC, send your mailing address to me at kpurvis@charlotteobserver.com and I'll get the book on its way. And thank you all for entering, for sharing your stories and for so many nice comments on the article by my colleague Andrea Weigl. Cookbook Giveaway: "EatingWell on a Budget"
In Wednesday's Food section, Andrea Weigl will make the case that eating healthfully can be just as cheap as eating junk. In honor of her story, we'll give one person a little budget break by giving away a copy of the book "EatingWell on a Budget," by Jessie Price and the EatingWell test kitchen. The book promises that all the meals can be made for less than $3 a serving. If you're not a regular reader of EatingWell magazine and its other books, the editors are clever innovators who focus on recipes that are delicious, doable and healthful. Here's an example, to add to the great recipes you'll find in Weigl's story. Enter the drawing for the book by posting your name (or a name I can use to identify you) in the comments here. Check back on Friday when we'll announce the winner. From "Eating Well on a Budget." You can trim even more money by cooking your own cannellini beans, but canned beans are convenient and are still a good value, especially if you stock up at sales. Preheat oven to 400 degrees. Cut fennel bulb in half lengthwise, then slice lengthwise into 1/2-inch-thick wedges. Quarter zucchini lengthwise. Toss fennel and zucchini with 1 tablespoon oil and salt. Arrange in a single layer on a large baking sheet. Roast, turning once, until soft and beginning to brown, about 20 minutes. Bring a large pot of water to boil while the vegetables roast. Add pasta; cook until just tender, 8 to 10 minutes or according to package directions. Heat remaining 2 tablespoons oil in a large skillet over medium heat. Add garlic and cook, stirring, for 30 seconds. Remove from heat. Coarsely chop the roasted vegetables into bite-size pieces. Add the vegetables, beans and bean- or pasta-cooking liquid to the pan with the garlic and place over medium-low heat. Drain the pasta and immediately add to the pan. Toss thoroughly and add tomatoes. Toss until just warmed through. Remove from heat and stir in the cheese and mint. Season with pepper and serve. Makes 4 servings. Per serving: 515 calories, 20g protein; 63g carbohydrate; 22g fat (7g saturated); 22mg cholesterol; 12g fiber; 350mg sodium. Before we scatter for the weekend, here's a tip from the Food pages that I want to make sure you don't miss. "Cover 2 cups of peas with water in a pot. Add a piece of seasoning meat, either ham or country ham, and bring to a boil. Reduce heat to a summer and cook for 20 to 25 minutes, until the peas are tender. Season with salt and pepper. Feel free to substitute broth and a tablespoon or two of butter instead of water and ham." Have a good weekend and don't forget to eat your vegetables. Corn Roast Day returns at the Matthews Community Farmers Market, after being cancelled for two years by drought. Joe Bonaparte and chefs from the Art Institute will do the roasting, and there is supposed to be gourmet flavored butters. Ears are $2 each (it's fund-raiser for the market) and it starts at 9 a.m. If you're out earlier, Marc Jacksina, formerly of Lulu and now of Andrew Blairs, will teach the 7:30 a.m. Chef's Secret class at the Matthews market. Topic is supposed to be "alternative cooking techniques." Knowing Jacksina, there's no telling what that means. One more from Matthews: Tomato Tasting Day is July 24. You'll get to sample dozens of kinds and vote on your favorite. I was lucky enough to land at the Carrboro Farmer's Market on Tomato Day last year, and I still cherish the memory of a tomato jam I met there. At the Davidson Farmer's Market, Saturday is Melon Tasting Day from 8:30 to 10:30. They'll have samples of watermelons, Sprite melons and Crenshaws. They're claiming the hot, dry weather has concentrated the sugars, making this year's melons especially sweet. Go by for a taste and test the theory. Southerners and Northerners, what's on your shelf? Tom Hanchett, the curator of the Levine Museum of the New South, needs your help with an interesting project. The museum is making some changes to the permanent exhibit, Cotton Fields to Skyscrapers to reflect the old and new cultures that call Charlotte home. One feature will be a grocery store shelf with the favorite foods of the various groups that live here. As a dedicated food searcher, Hanchett has the Latino, Vietnamese and Indian/Pakistani groups covered. But he'd like suggestions for the Northern and Southern products. Soft drinks: Southern - Cheerwine. Northern - Dr. Brown's? Potato chips/snacks: Southern - pork rinds. Northern - ? Canned vegetable or fruit: Southern - black-eyed peas or collard greens. Northern - ? Hot sauce or other sauce: Southern - Texas Pete. Northern - Buffalo wing sauce? Cookies: Southern - ? Northern - Tastykakes. Spices: Southern - Barbecue dry rub? Northern - ? Flour/rice/grains: Southern - grits (what brand?) Northern - ? Post your suggestions in the comments and I'll let Tom know to watch for them. Personally, I'd think the cookie list is missing a Moon Pie and a black-and-white cookie. Domino's Pizza wants to make the point that what you see in the pictures is what you get in the box. So it's doing away away with anything that smacks of food styling. No steamer-softened cheese stretches or blow-torch browned spots. (Pity - there's an art to making food look both real and tasty.) To mark the occasion, they're having a contest: Take a picture of a Domino's pizza and win $500. You have to shoot the pizza au naturelle and submit the picture at www.showusyourpizza.com by July 26. Have you ever entered your cooking in a fair? The season is coming. The Dixie Classic Fair, Oct. 1-10 in Winston-Salem, has more than a dozen food competitions this year, from the Great American Spam Championship to the Fried Apple Pie Contest. Get details, deadlines and entry forms at www.dcfair.org. If you're aiming for the N.C. State Fair, Oct. 14-24 in Raleigh, the competition premium book that lists those cooking contests will be available in August at www.ncstatefair.org. So maybe you can't be the next Food Network star. Or even the Top Chef. You still have a chance at being a hot food blogger. Food-blog aggregator Foodbuzz is sponsoring Project Food Blog, a series of challenges focusing on food bloggers. Dana Cowin, editor-in-chief of Food & Wine magazine (you know, a magazine -- one of those old print media things) is the judge. The last blogger standing (typing? posting? uploading 12 pictures of the same thing?) gets $10,000 and gets featured on Foodbuzz for a year. This is why it’s handy having a farmers market on a weekday uptown. It was the end of the day last Tuesday. At home, the cupboards were bare because I’d had to miss my usual Saturday market expedition. A teenager was waiting to be rushed off to his evening appointment. I was too hot, tired and drained to have much energy left at all. I pulled into the Atherton Mill Market, 2104 South Boulevard in SouthEnd, grabbed a couple of bags and dashed inside to see what I could find. A handful of green and white Zephyr squash. A bag of newly dug potatoes, from thumb- to marble-sized. 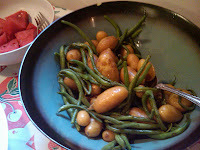 Haricot vertes-type green beans as skinny as embroidery thread. A bag of freshly shucked corn. A small Sugar Baby watermelon and a cantaloupe. A round loaf of roasted garlic & olive oil bread and a tub of the hot tomato oil from Duke’s Breads. A couple of packages of freshly harvested chicken wings from Red Dirt Ranch. 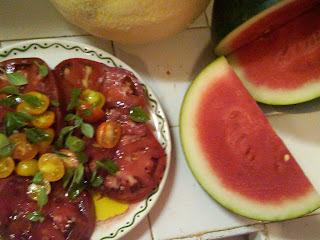 Tomatoes, of course -- a fat red heirloom and a box of orange Sun Glos. Rushing into the house, I found the teenager had already eaten and was on his way out. A reprieve, and dinner just for two of us, empty-nesters in training. I put the corn, squash, tomato oil and chicken wings away for later in the week and set aside the cantaloupe for breakfast. On the counter, I spread out the tiny potatoes and green beans, the watermelon and the tomatoes. I looked them over and came up with the easiest dinner I could. First, two links of Trader Joe’s chicken sausage left over from the night before went into a skillet to brown slowly. 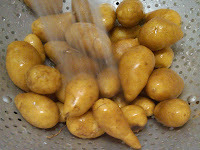 I scrubbed the potatoes under running water to take off the last of their du sty dirt and piled them in a skillet with just enough water to cover, a squirt of olive oil and a fat pinch of kosher salt. I put the lid on and brought it to a boil for 10 minutes. Tiny potatoes don’t take very long to cook. While I waited, I pinched the tops off the little green beans. I put them on top of the potatoes and covered the skillet for 2 minutes longer, then took the top off and let the water boil away, letting it all finish cooking in the salty oil left behind. While the potatoes cooked, I cut a couple of fat wedges of the roasted garlic bread, wrapped them in foil and tossed the package in the toaster oven to warm. I sliced the fat red tomato and arranged it on a plate. I topped it with a pile of halved Sun Glos and some shredded basil from my garden, a drizzle of olive oil and a sprinkling of coarse sea salt. I sliced into the watermelon and found flesh that was as magenta-red as raspberry sorbet, a color so deep it almost looked fake. I cut away bite-size sweet chunks and piled them in a bowl. Twenty minu tes later, we were sitting down to plates with just a little chicken sausage, piles of green beans and potatoes, tomato salad with plenty of juice to soak up with the wedges of warm bread, and watermelon. It looked like a painting of summer and tasted like someone else’s life, someone more sophisticated, more elegant. M.F.K. Fisher, maybe, or Ruth Reichl. Stopping to market on the way home like we’re living in Paris. I could get used to this. Next Wednesday, my colleague Andrea Weigl will bring you a story about the joys of summer vegetable plates. In the meantime, I hope you have a Fourth of July weekend full of all the fresh produce you can find.